At Budget Blinds of Southwest Lubbock, we're your local neighborhood experts that truly understand your needs. We're in your neighborhood, we know the local Southwest Lubbock weather and community, and we’re backed by the #1 provider of blinds, shades, and drapes in North America. Over 25 years of customer satisfaction gives you peace of mind that only comes with choosing the proven leader. We bring the showroom to you in Southwest Lubbock. We expertly measure your space, install beautiful window treatments, and back it up with the best warranty in the business so you can sit back and relax in the beautiful, Southwest Lubbock weather and sunshine. We serve to give you the best in window treatments, so you can rest easy knowing your space will be beautified and optimized with window treatments that fit your individual needs. We love helping our customers find the perfect window covering, one that meets their style and budget! Team Budget Blinds of SW Lubbock is here to help you from selection to installation! If you’ve been thinking about transforming your home’s interior into something truly special, then Budget Blinds serving Southwest Lubbock is here to help. 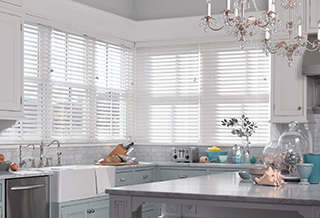 Our expert design team, paired with a dazzling array of stunning blinds, shades, shutters and drapery, creates the ideal home interior that complements any room, or an entire home. Throughout southwest Lubbock, and beyond, we’ll show you how fun and affordable it can be to upgrade your décor with the power of the #1 provider of custom window coverings in North America. As proud supporters of The Lubbock Dream Center and the Parkridge Pregnancy Center, and as a regular volunteer and donor of window coverings to the Texas Boys Ranch and Meals on Wheels, we know what local support and service is all about. Plus, we’ll bring our entire gallery of state-of-the-art, fashion-forward window coverings right to you with our FREE in-home design consultation. Throughout southwest Lubbock, we’ve been upgrading the look and value of area homes just like yours for years. See what you’ve been missing in trend-forward window fashions that deliver both value and stunning looks year after year. Call or click today and schedule your FREE in-home design consultation and let Budget Blinds serving Southwest Lubbock brighten your windows and your day. As proud Texas Tech University graduates, we love being part of the Lubbock community! From cheering on our Red Raiders to giving back, Lubbock is our Home! Join us as we help our community through the New Legacy Women's Center. Very Pleased. Shutters look beautiful!! Beautiful shade! Good installer! Definitely will refer BB of SW Lubbock to my friends! Second time BB of Sw Lubbock installer has been at my home, always very nice, professional and polite.